Our new poster for The Capital Mashup! 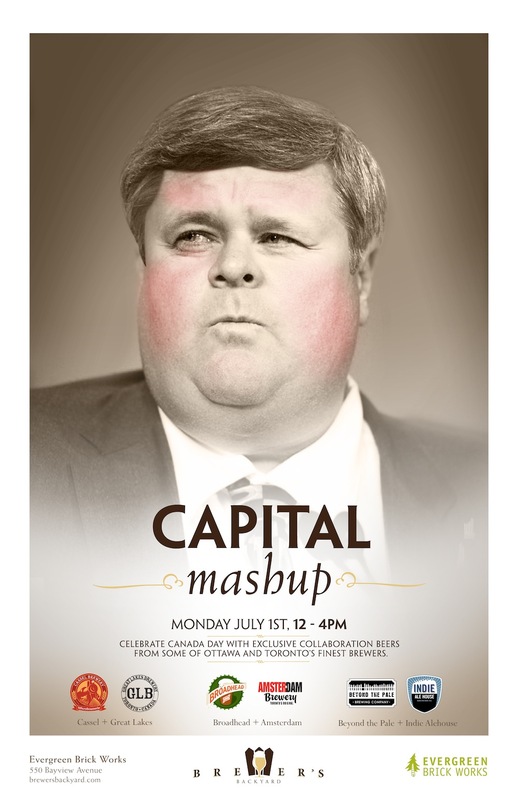 The Brewer’s Backyard returns on holiday Monday, July 1st to the Evergreen Brick Works with a very special event entitled The Capital Mashup. What we’re doing at the event is possibly the first time it’s happened – a triple collaboration between three breweries in Toronto and Ottawa, to be served simultaneously. We’ll be having three exclusive beers that have been brewed by Great Lakes + Cassel, Amsterdam + Broadhead and Indie Alehouse + Beyond the Pale. The beers will debut at the Brewer’s Backyard and be served again at the Brewery Market in Ottawa on July 7th. We’re really excited about these collaborations and there will be very limited quantities of each, so you’ll want to get there early to have a taste. We’ll also be serving beers from Great Lakes, Amsterdam and Indie Alehouse as well so there will be plenty of beer to enjoy. We’re going to have some great food as well – as of this moment we’ll be having delicious meat pies from Kanga (formerly known as Meat Pie Mates), a delicious dish from the Indie Alehouse as well as ice cream sandwiches from Sweet Sammies. So mark down 12-4pm on Monday, July 1st at the Koerner Gardens and Holcim Gallery of Evergreen Brick Works to celebrate the great beer scenes that we have in Ontario’s capital cities. Admission is free, and you can pay for beer and food at the event. We accept Visa, MasterCard and debit so you don’t need to worry about having a lot of cash. We’ll toast Canada Day in style!